Toyota City, Japan, November 26, 2012—Toyota Motor Corporation (TMC) today began full-scale operations at its ITS Proving Ground, a new test site—within the grounds of the Higashi-Fuji Technical Center in Susono City, Shizuoka Prefecture— established with the aim of reducing traffic accidents through Intelligent Transport System (ITS) technology. The new 3.5-hectare ITS Proving Ground simulates an urban environment with carefully replicated roads and traffic signals. 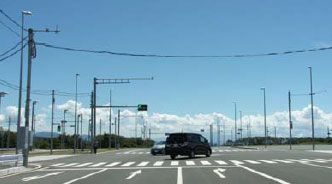 The site is equipped with a road-to-vehicle communications system consisting of a vehicle detection system, a pedestrian detection system, a course monitoring system, traffic signals and control devices. The communications system runs on a band which was allocated for ITS by the Japanese Ministry of Internal Affairs and Communications. This communication band is easily diffracted and reception over wide areas is possible, making it effective for communications with vehicles at intersections and other locations with poor visibility. With the start of full-scale operations at the ITS Proving Ground, TMC will accelerate its research and development of environmental systems designed to improve fuel efficiency as well as safe driving support systems that seek to prevent accidents involving pedestrians and other vehicles in urban areas and at intersections. 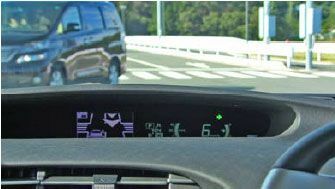 TMC is also conducting research and development on next-generation vehicle-infrastructure cooperative systems that support safe driving1 and that have been designed to prevent accidents involving pedestrians and other vehicles at intersections with poor visibility through the continuous exchange of road-to-vehicle, vehicle-to-vehicle and pedestrian-to-vehicle information. At the special-purpose ITS Proving Ground, TMC will work toward the early practical adoption of evermore reliable systems by repeatedly conducting testing and evaluations that can be difficult to perform on public roads with changing road environments. TMC considers the elimination of traffic fatalities and injuries the ultimate goal of a society that values mobility, and is therefore conducting research and development on individual onboard safety devices and systems based on its Integrated Safety Management Concept2, an approach that gives direction to safety technology and vehicle development. TMC is pressing forward with the development of safer vehicles and technologies and is intensifying its wide-ranging traffic-safety initiatives by participating in the development of safer traffic environments and promoting traffic safety education.